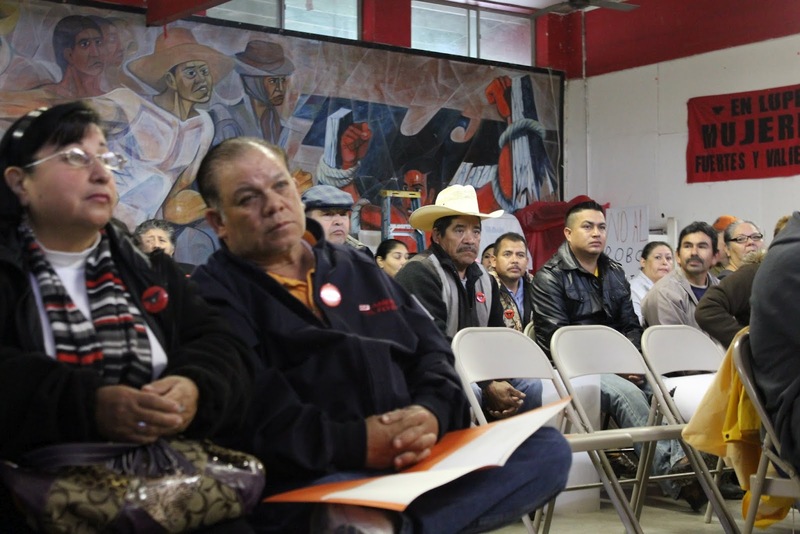 On a chilly Saturday morning in the late south Texas spring, a couple of hundred members of La Union del Pueblo Entero (LUPE) gathered in their union meeting hall. A group of old timers were churning out conjunto music, with the accordion player getting peoples’ feet tapping; this despite a woeful bass player who kept hiding behind the speakers, even as he pulled and plucked one wrong note after another. Fresh-baked Mexican rolls were passed out along with coffee, and then people were bid to stand, and we were asked to join in reciting Cesar Chavez’s Farmworkers’ Prayer. We were all present at LUPE’s colonias’ cumbre (a coloniais type of Texas border shanty town– more than 300,000 people in Hidalgo and Cameron counties live in colonias; a cumbreis a summit meeting). This gathering of border neighborhood leaders who were Union members, was being asked to decide the priorities for the next two years’ of work. It was quite a serious group of people. They were being asked to give up a precious Saturday morning. A free morning for an hourly-wage earner is as rare as a raise. It was a mixed crowd, as well, with men and women, and older and younger people equally represented. The leadership reflected that mix, with the veteran Juanita Valdez Cox sharing time with rookie Daniel Diaz, and the seasoned Martha Sanchez trading off with a young Yvette Sanchez. After the introductions, and some laughter, and some applause, the group got down to work. The spirit of Cesar Chavez, a man who had visited this room during past cumbres, seemed to settle down upon us all. Chavez, a deeply spiritual man, was, in the end, an entirely practical person as well. The concerns put before the group were, therefore, seemingly mundane: we need some form of state-recognized identification for everyone, we need streetlights, we need parks, we need English-language classes. Vest-pocket parks as a human right—at first glance, this may seem a bit of a stretch, if not an outright exaggeration, but the conversations around the issue made the connections quite neatly. “Health care is a human right, but nobody can afford to see a doctor, so we have to do the best we can not to get sick. Around here, everybody has diabetes, everybody’s kids are fat (“gorditos están todos”). They need a place to run. That’s right—we have a right to exercise!” exclaimed Doña María, one of the oldtimers. The representatives from the colonias El Jay, Azul, Mi Sueño and Los Amigos offered perhaps the most interesting—and challenging–resolution. These representatives noted that life without a drivers’ license (or some other form of official identification) in modern-day Texas is a nightmare. Without such an i.d., one cannot open a bank account or cash a check. Auto insurance is much more expensive if you don’t have a drivers’ license. Worse, in south Texas, where there is as yet no viable public transportation system, it is impossible to work without a car—yet undocumented citizens are forced by circumstances—again—into breaking a law that they would happily obey, if they could. Why should the State of Texas offer a drivers’ license to an undocumented person? Juan Lopez, a younger fellow, told me quite earnestly, “The police WANT us to have an identification. They want to know who we are—and that is fair. My daughter WANTS me to have identification, because she knows that if I get stopped by the police, for any reason at all, then I could get deported, and she would be without her daddy. And that is just wrong.” His daughter had her arms wrapped around his leg as he spoke to me. She seemed to me to be too young to understand any of these distinctions. As she smiled up at her quite serious father, her eyes glowed with the only resolution, the only commitment that matters in any of this—her love for her dad. Despite the chill and the misty rain, it was a good morning for a town hall meeting, for a cumbre, for a gathering of neighbors, and for politics. The delegates filed out of the auditorium, heading for their colonias and their homes, for the hard work that is living out a dream. One little girl held her father’s hand as they made their way to their car. Cesar Chavez, from up on high, offered the dad his quiet smile of assurance. It will be all right, he seemed to say, it will be all right.